Duke University’s Fuqua School of Business is a community oriented MBA program seeking a diverse class of accomplished students. Fuqua has a relatively new admissions director, Shari Hubert, who has written some excellent blog posts about Duke and what they are searching for in the admissions process. Duke is interested in understanding who you are, and asks for a snapshot of your personality with the enduring “25 random things” essay. Along with using this set of essays to tell the story of your personality and background, it is important to demonstrate that you know Duke Fuqua well and are a strong fit with the program. Starting your research and personal networking now will put you in a solid position to prepare the most specific and effective essays. Stacy Blackman Consulting can help you prepare a compelling, individualized strategy to approach your Duke Fuqua application this year, contact us to learn more. This career goals essay asks for your plan in three parts. First, you should describe what you plan to do immediately after your MBA. Then you’ll explain the long-term vision for your career. Finally, Duke admits that many career paths are forged through circumstance, and asks you for your Plan B. Think big picture and focus on the overall story trajectory. What would be the most logical (and interesting) progression from your current skill set and MBA education? How will your next step flow from the combination of those experiences? The career goals essay is about your ability to assess your background and plan your future, not a promise you are required to fulfill. As you consider your alternative path for this question, think about plans that fit with your background and goals, but show what you could explore if your primary plan doesn’t materialize. Flexibility is a useful character trait in a changing world, and showing that you can adapt is part of the task of this essay. For example, perhaps you are focused on becoming a marketing executive within the consumer packaged goods industry, such as General Mills. If you don’t find the suitable position after Duke, maybe you would consider marketing for a retailer, such as Target, as your alternate career path because it allows you to develop a marketing career as well. Or, you may have two disparate interests and want to consider both of them. Perhaps your Plan A is to join a strategy consulting firm after graduation, but if you don’t receive a spot among your top choices you would think about co-founding a start up as another possible path. Think about your range of interests and go from there. Because you have limited space, you’ll have to boil your plans down in a clear statement of what you plan to do, but ideally any plans are supported by the information provided in your resume, recommendations, and other essays. This essay is entirely open ended and you can cover topics spanning your personal background, work experiences, values and hobbies. If you have a particularly interesting story in any of those areas, this is the place to tell that story. Director Hubert has posted her own 25 random things, including items from her famous aunt to her love of vegetables. This list shows her personality and also ranges from the serious to the frivolous. Consider that range as you compose your own list. Coming up with 25 random things to list in this essay may seem daunting at first. To jumpstart your creative process you may want to brainstorm with friends and family about what is most interesting and memorable about you. Or keep a notebook with you to record thoughts as you go about work and personal activities. Once you have 25 random things, how do you structure your list? There’s a few possible ways to proceed: chronologically, chunking the list into themes, or even alphabetically. You may want to organize the list so that it builds from shorter to longer items, or you may want to intersperse some of the 25 random things that require a paragraph explanation between sets of things that are easy to understand in one sentence. Structuring the list to make it easy to read and follow will be appreciated, but resist the urge to package the list too perfectly. Content is always the most important factor and remember that the primary purpose of this essay/list is to show Duke your multi-faceted life, personality, and interests. The best essays will be both specific and personal, while demonstrating you have done your homework on Fuqua. While everyone benefits from a diverse alumni network, what specifically do you want to give and receive from your classmates? If you describe clubs and classes you are attracted to, also offer specific examples from your past experiences to show your consistent personal or professional passions. Your fit with the program is crucial, and it will be ideal to show the personal qualities that Duke prizes. The Duke MBA program is especially interested in your role within the community, and will place significant weight on this factor. If you research thoroughly and are specific, you should be able to clearly demonstrate why you are going to be strong contributor to Team Fuqua. This essay can also be a place to talk about how the Duke MBA fits into your career goals. What do you know now that will be enhanced through your MBA education? And what crucial aspects of the skill set required for your future career will be augmented by attending Duke? However, the main focus should be your community involvement and how you plan to improve the experience of others at Duke both in and outside the classroom. The Admissions committee at Fuqua asks that you use this space only to explain extenuating circumstances, not just to add new information to your application profile. If you have a low GPA, lack a recommendation from your current supervisor or have gaps in work history this is the correct place to address those issues. If you do not have any of those areas to explain, just skip the question and focus on the previous three essays. When approaching any concerns about your background in the optional essay it’s important to show that your recent performance, whether academic or professional, has demonstrated recovery from the issues of the past. Your goal is to remove questions from your application and to address in a factual manner any information the admissions committee needs to know to fairly evaluate your application. 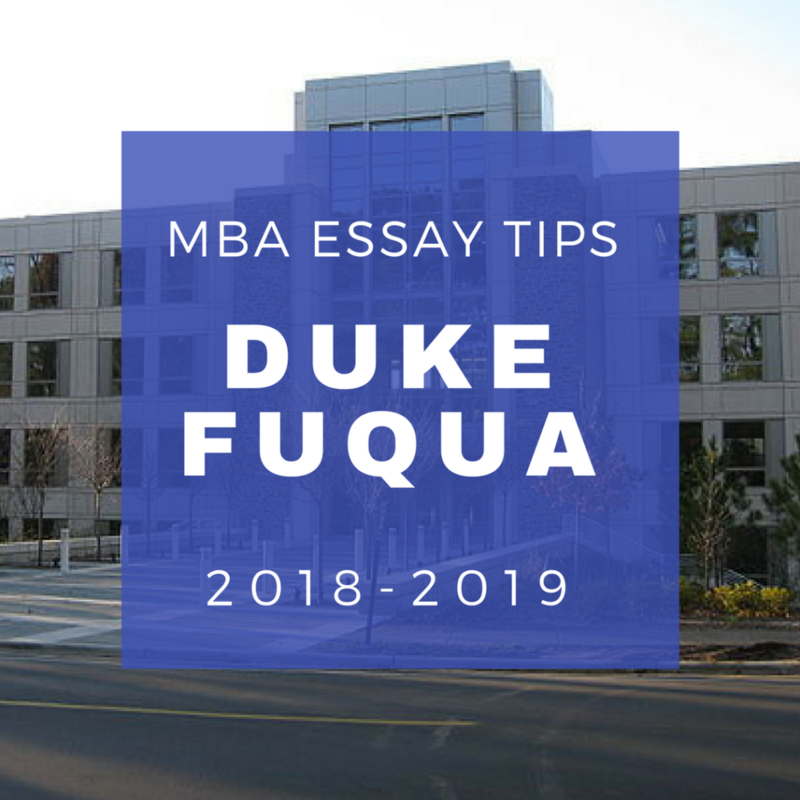 The essay should convey, in a positive manner, that you know there could be questions about your background but you have thoroughly improved in any areas necessary and are now ready to contribute to the program at Duke Fuqua. If you are looking for guidance on your Fuqua MBA application, Stacy Blackman Consulting can help with hourly and comprehensive consulting services. Contact us to learn more. Visit the website for Stacy Blackman Reviews, and check out the company’s e-publications for more in depth school-by-school guidance. If you have been invited to interview, your application has enticed the admissions committee – you are on the right path towards a potential admission. That said, there are no guarantees that interviewed applicants are admitted (each school’s interview to admissions ratio varies) and must make every effort to showcase your candidature and move the admission pendulum forward. The interview is an opportunity for the admission team to delve deeper into your personal and professional story; it is imperative that you do what is necessary to prepare for the interview. While you have spent a great deal of time on your application, chances are a few weeks/months have gone by since you worked on it. It is good practice to re-acquaint yourself with the stories you’ve shared and message you’ve presented, and re-direct your mindset towards admissions mode of thinking. Re-read your application in its entirety. Typically, the interviewer has read your application, either in part or in full, so being mindful of the stories you’ve already presented is critical, as you do not want to be repetitive. When you think of new stories to share in your interview that highlight your contributions to your community and leadership experience, for example, think of new anecdotes that convey the underlying themes in your application. Be ready to talk about your work. Be mindful that the interviewer might not be familiar with the technicalities of your field. Use the pre-interview preparation time to diligently outline how you will convey what you do to a non-industry person. For example, if you are a chemical engineer, and a part of your job involves finding the lowest cost for raw material without it affecting the environment, then make the connection to the importance of the role – in agriculture, choosing the wrong chemical can damage the soil, which hurts the crops, and affects nature. In other words, paint a mental picture for the interviewer about what you do using language a layperson can understand. 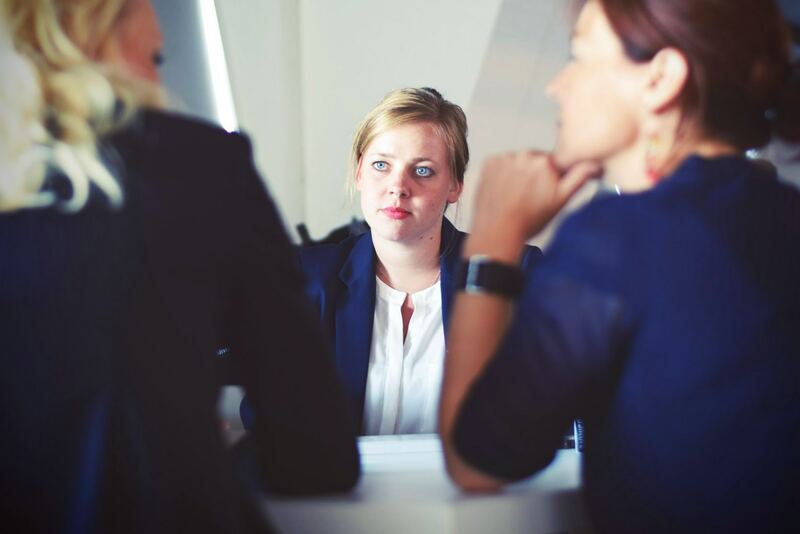 It is unfair to expect an admissions member to understand your field fully, so use this opportunity to teach the interviewer about the exciting work you do. You should also take the opportunity to re-research the school. If you have kept notes from your initial research, re-read them or re-research the schools and re-acquaint yourself with the reasons you applied to the program. What is it about this program you find enticing? How will the coursework help you develop professionally? What opportunities does the school offer that made you apply? What are the school’s placement metrics? Do those metrics support your post-MBA goals? Gather as much information as possible, as it will be useful to the conversation during the interview. Being prepared to not only speak about yourself but also about the value of the program and the institution showcases a seriousness with how you approach crucial decisions and the earnestness with which you take the interview. A part of being a successful student is your willingness and ability to ask questions and learn. Having questions prepared in advance gives the admissions team at least two (2) impressions about your candidacy: (i) you are serious about your education and continuous development, and (ii) the critical nature with which you evaluate the information available on the school’s website showcases an individual who takes every opportunity to learn and grow. Prepare at least five (5) questions and order them by the level of importance before the interview. You may not have the chance to ask all five (5) questions, so having the most important answered first is crucial to making the most of your time with the admissions representative. Do not hesitate to bring your questions with you at your interview – the admissions team will only view this as a sign of being prepared. After you have gone through these steps, solicit the help of a friend and/or a person you trust to help you prepare. You can prepare questions for them, or they can ask you questions. The idea is that you should practice out-loud your “pitch.” Ask your friend or a person you trust for constructive feedback, including the language you use to answer questions, the clarity of your ideas, and any other component that may help you polish your presentation. Also, ask that they evaluate the content and the clarity of your questions. As Robin Sharma writes in “The 5 AM Club,” “Sweat more in practice, bleed less in war” (134). On the day of the interview, smile, be yourself and enjoy.